Better living through creativity… and cocktails! If you think we’re completely unpacked yet, you really haven’t met us, have you? But we’re getting a lot closer, and each room we manage to clear of empty boxes and packing paper reminds me of just how much space we’ve given ourselves to stretch out in! I was watching the movie Tiny the other night (via Netflix) and thinking about how here’s this movement of people downsizing their lives into 200 square feet or less and we just moved into a house that is almost 3000 square feet. Way to go, bucking the trend, right? And while I admire their simplified lifestyles, I know me well enough to know how much I love my stuff. It doesn’t define me, but it’s awfully nice to have around! 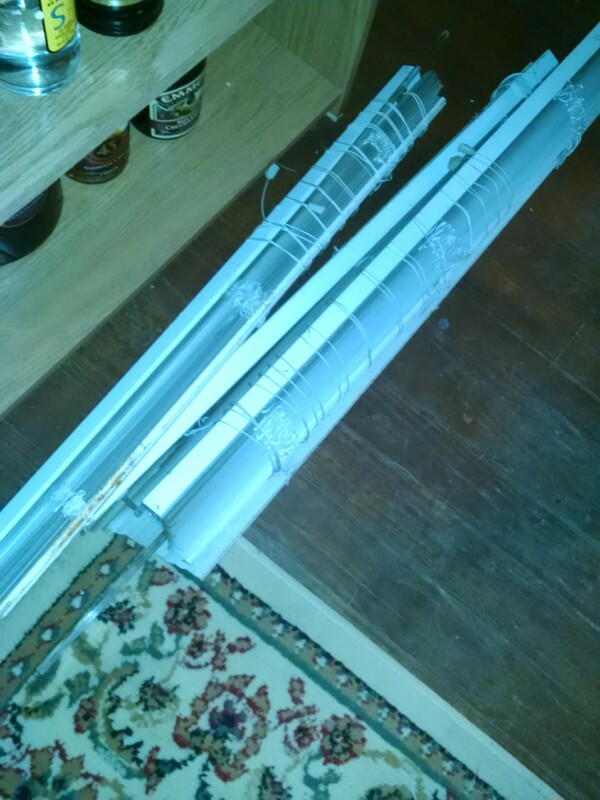 One war we’ve been waging, lately, is against the window coverings in this house. Have I mentioned how much I despise mini-blinds? If not, let me be clear: I cannot stand the things! They clatter when the wind hits them, they collect dust like whoa!, are a pain to clean, they get bent out of shape/break easily and they are just plain ugly to look out. I’d almost go so far as to say I hate them, but I’m trying to reserve that word for the really bad things. Like Triple Sec. It started with the guest room–that was the only room in the Dollhouse that had no window treatments whatsoever and the sun was coming in strong through the rear window, not helping the second floor keep anything close to cool. Thankfully, we had some drapes we used in our last bedroom and were able to toss those up as a stop-gap if nothing else. We try not to remind our curtains of their shortcomings. This also pointed out to me just how freaking expensive proper drapes are going to be for this house! 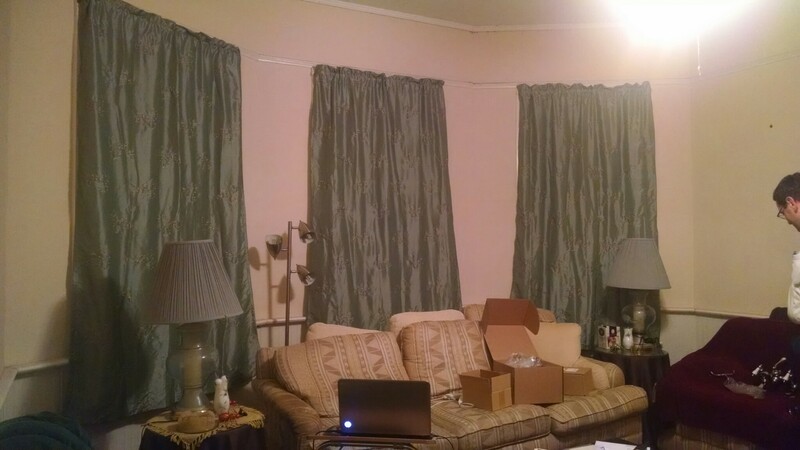 The curtains we hung barely covered the window itself and certainly don’t come anywhere near the floor. We have some long, tall drink of water windows in this place. But for now, at least this room isn’t acting quite like a sauna anymore. Once those were in, we started to assess which rooms needed the most help as we unpacked more boxes and came across more draperies from rooms past. 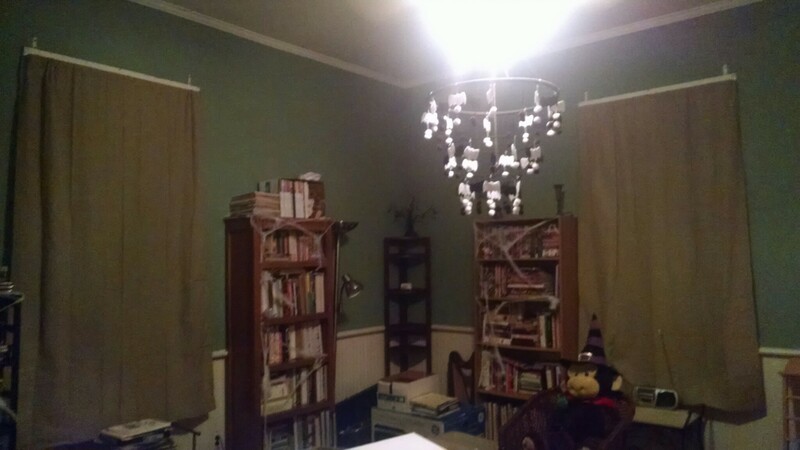 The library and dining room both get more than their fare share of sun, so the next two sets of panels (just as comically short on our walls) went to each, respectively, and then we found a trio that would work for the living room bay. Now, these are not necessarily indicative of the direction we’re going in each room, just a process of settling in. 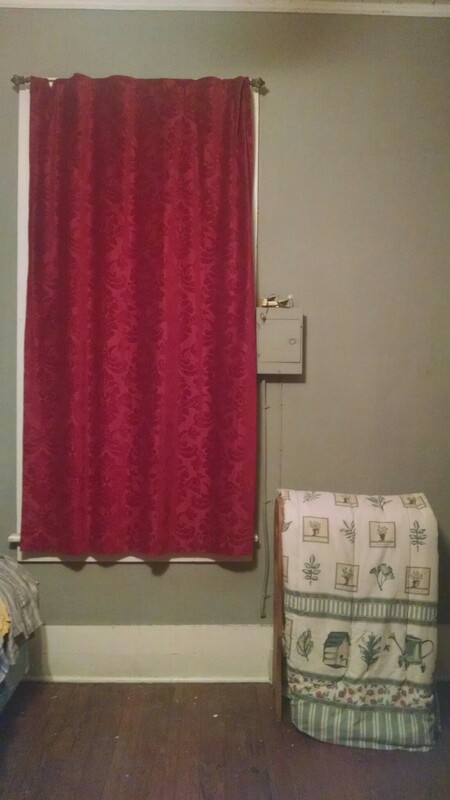 We’ve been using the super cheap ($0.97) basic curtain rods just to get them up there and mounting them to the wide wooden window frames (some holes were already there, bonus!) to avoid having to drill through or anchor anything in the plaster just yet. Eventually there will combinations of pull-shades and custom (by moi) draperies in each room as we decide the colors and theme as we go along. Another big sign of progress? The shower converter for the upstairs clawfoot tub has been ordered!!! 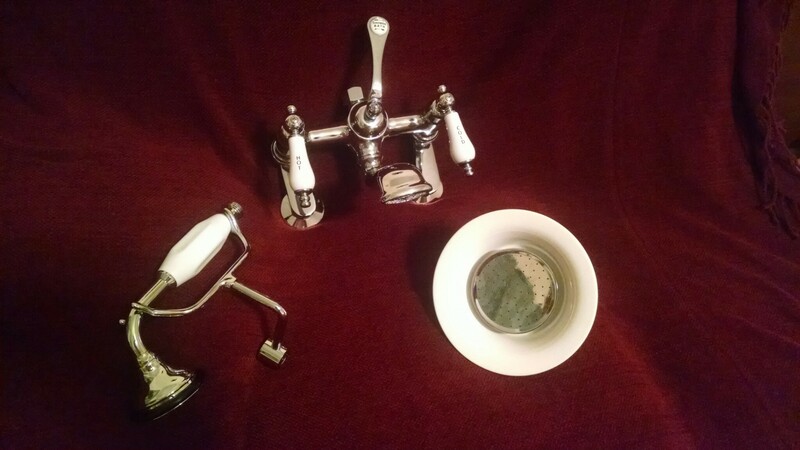 From a quick search of clawfoot tub fixtures you’d think finding what we wanted would be a relatively simple thing. Would you believe we’ve been searching pretty much since we closed on the Dollhouse? I’m afraid I was at least partially to blame for the delay. You see, I really wanted a handheld shower head option in addition to the fixed shower head. I’ve lived with and without them and really prefer the convenience. But since we’re dealing with a (potentially) gorgeous antique tub, I didn’t want some clunky plastic modern thing messing up the look. 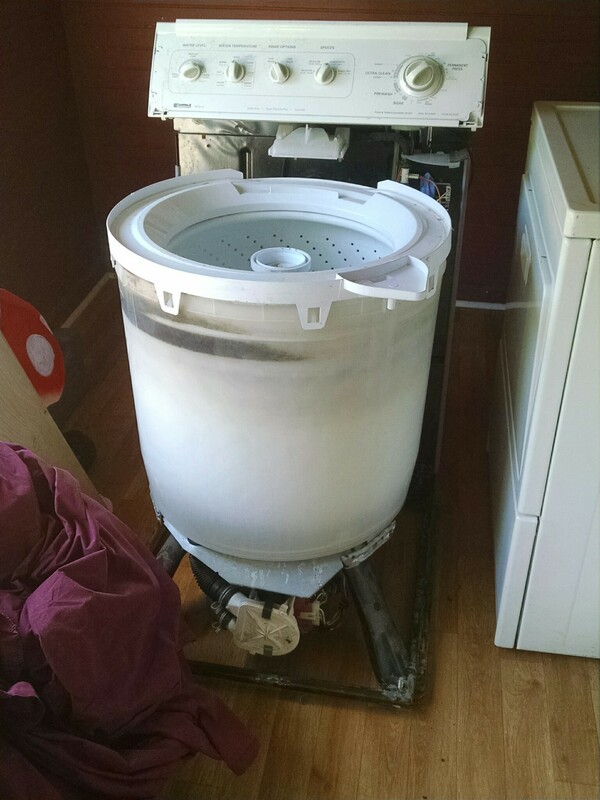 Todd didn’t think my request was all that out-there, but as we searched it became difficult to find a set that a) mounts to the front of the tub and not on the rim or side, b) had the right spacing for our narrow fittings, and c) wasn’t $1000 or more. 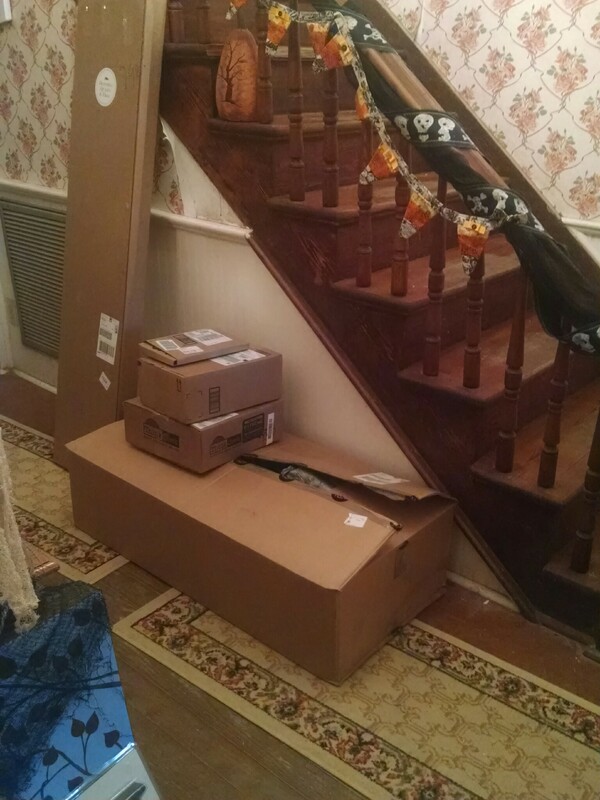 A glimpse of the beuaty withing that big ol’ box! I’m in love! Bathroom fixtures (and kitchen, for that matter) always seem incredibly expensive for how little space they take up, but the sticker shock from early online shopping (no one seems to have them in stock, even the basic ones that the local hardware storesÂ do carry) had me rethinking my position on the handheld shower head. Was it really that important? No. And I suggested that maybe we could get a “normal” shower converter and add a handheld option later, even if it wouldn’t be as pretty or “princess phone” style (that’s what they’re called). But enough searching really does yield results and he was able to find one that met our material requirements while being under $600. Which is a good thing, since that’s more or less what we had “budgeted” for this piece of the puzzle based on the amount of the security deposit we got back from the rental. I’m definitely looking forward to showering upstairs in the non-cave bathroom very, very soon. It means I can move my getting ready gear (underclothes, jewelry, and basic makeup) upstairs where it belongs instead of in my office where I get dressed for work each morning, currently, and I won’t have to cart my clothes downstairs each morning. The part for this came in, too. Let’s just hope it works!